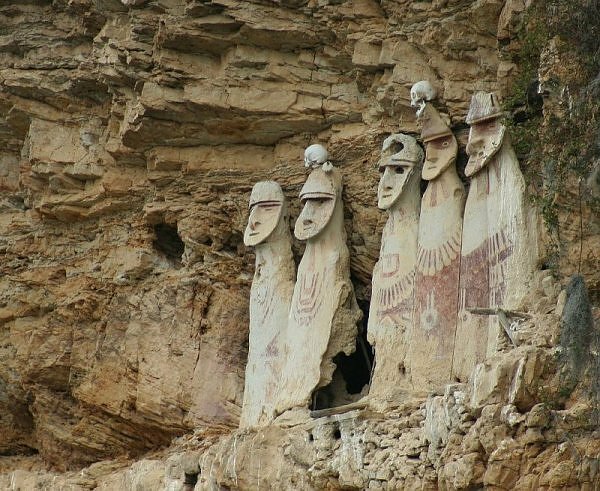 The Chachapoyas, (in Quechua “The Warriors of the Clouds”), were an Andean people living in the cloud forests of the Amazonas region of present-day Peru in about 9th-15th centuries AD. The first firm evidence of the existence of “cloud people” dates back to around 600 AD which is 600 years ahead of the appearance of the Inca Empire. Chachapoya are first known peoples to have occupied the forested mountains between the rivers Marañón and Huallaga in Peru at an altitude of 3000 meters (9,840 ft) above sea level. The Chachapoyas' territory covered 30 thousand sq. km. This culture created numerous stone settlements, mausoleums and sarcophagi, fragments of which survived until recent times. In 1470 when the Incas attacked the lands, the Chachapoyas left the territory trying to retain their independence. The fortress of Kuélap (or Cuélap), associated with the Chachapoyas culture. It is situated on a ridge overlooking the Utcubamba Valley at an altitude of 3000 meters (9,840 ft) above sea level. The monument of Kuélap was constructed for offering a defense against the invaders. It had only one access corridor, sufficiently narrow to allow only one person at a time to enter and was surrounded by 20 meter (65 ft) high walls. Radiocarbon dating shows that the fortress was inhabited from the 6th to the 16th century AD. It is a huge fort and city of 400 buildings surrounded by a huge 20 meter (65 ft) high defensive wall. The structure of stone buildings is circular and they were built on platforms. They had cone-shaped roofs covered with leaves. With average 4000mm precipitation a year, these architectural styles were not superfluous. The Chachapoyas had excellent engineering skills. Their magnificent drainage system helped to avoid flooding of the buildings. Due to rainy climate the best time to visit Kuélap is during the dry season, between May and October. It is an spectacular funerary site, where we can find sarcophagi in the form of human mummies that were placed inside each coffin. They were capsule-like tombs constructed of straw clay and mud also using bamboo to make the shape of the body and elaborated “faces”. The “bodies” were painted red and white; probably that was the “portrait” of deceased. The figures were placed in groups of 4-8 on cliffside perches. Archaeological complex of six mausoleums presents architectural features of the Chachapoyas culture and is decorated with rock paintings. It is located near the stunning lagoon with greenish blue water. More than 200 mummies, fine fabrics, ceramics woodcarvings, decorated matt quipus (recording devices of Indians sometimes called talking knots), crowns, and various valuables were found in the mausoleums. The items discovered in the mausoleums indicate 3 different historical periods: Chachapoya (ca. 800-1470 AD), Chachapoyas-Inca (ca. 1470-1532), and early Colonial (ca. 1532-1570). Each tomb is about 3 meters high and is divided into two levels by a platform of small logs. The structures are basically squares constructed of blocks, with windows that all overlook the lake. The quipus (recording devices of Indians sometimes called talking knots) found in the Lagoon of the Condors is the biggest archive found to date. It consists of 32 Quipus, 22 of which have been intensively studied by Dr. Gary Urton. Unfortunately, 10 of them were determined to be too fragile to be analyzed. All these quipus, as well as mummies and items found in the mausoleums are now safe and protected in Leymebamba Museum. Museum Leymebamba displays mummies, fine fabrics, ceramics woodcarvings, decorated matt quipus and other things recovered from the Laguna de los Cóndores. You can take a bus or flight from Lima to Chachapoyas. In Chachapoyas you have to take the available transport to the village of Tingo. After a four hour drive, you reach the end of the road, from this point you must go up to Kuelap, located on top of a mountain. The journey takes about 20 minutes. Trekking enthusiasts can make the journey on foot, on a long journey that connects Chachapoyas to Kuelap. The route will be as follows: from Chachapoyas to the village Сorazon de Jesus, then to Huaychapampa, Juscubambo and Tingo. This complex is located near Leymebamba. From Leymebamba you can ride donkeys (10 hrs) or walk. The working hours of the museum are Tuesday to Sunday from 9.30 to 16.30.